Having an RV also gives you the responsibility of taking care of it so it will serve its purpose for a long time. Note that it serves as your moving home when visiting campgrounds or going on a trip that’s why you have to exert an effort to last long. One way to keep it protected and maintain its excellent condition is to apply the best RV roof coating to it. The coating is always a part of effective RV roof maintenance. One of your common choices is rubber coating. Rubber is a popular material for the RV roof. In this case, the rubber roof may come in the form of EPDM or TPO. If you are in need of the best EPDM rubber roof coating, then note that your options often include the liquid variety. A liquid EPDM coating actually refers to a synthetic rubber material, which is available in liquid form. You have to apply this liquid roof RV coating on the area. Once the coating cures, it can produce a sturdy coating for your RV’s roof, which can last for a maximum of 10 years. What’s good about the EPDM coating is that you can easily apply it. It is even possible for you to complete the whole process in just one weekend provided the weather is good for the curing process. The EPDM liquid RV roof coating is also known for being weatherproof, puncture-resistant, energy-efficient, and flame-retardant, which means that there’s no need for you to worry too much about spreading fire in case some nearby campfires get out of hand. If you are looking for an EPDM liquid coating for your RV’s roof, then you will surely find Proguard F99911 useful. You can use it as a coating for a newly installed rubber roof. You also have the chance of using it to do repairs to your present roof. One major advantage of this liquid roof coating is that it only involves a single coat application. It works 100% as an EPDM rubber coating while also boasting of up to 5-year warranty. Another advantage of this liquid coating is its wide coverage. It comes in a 1-gallon kit, which is capable of covering an area of around 42 to 45 square feet. In addition, it is capable of withstanding a wide range of temperatures – from 6o degrees to 300 degrees Fahrenheit. 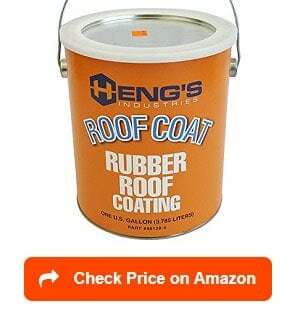 It delivers an excellent performance as a liquid roof coating. Once it cures completely, you will enjoy the nice layer of rubber that it provides. The coating is also 100% white and shiny while also providing a nice rubbery feel. It is easy to apply while also boasting of its quick dry time. You will also love the thickness of this coating. It is just right, not too thick nor thin, making it really good for your RV roof. You can also take advantage of Heng’s rubber roof coating if you need to coat your RV’s rubber roof. It works well in sealing EPDM rubber roofs. It is also useful on seams and tears as well as in sealing vents and air conditioning units. This roof coating is a good choice if you are just in search of that with a 1-gallon capacity at the most reasonable price. It is suitable for those who are planning to do a single application or two coatings and decide whether another product will work for their needs next time. One advantage of this rubber roof coating is that it is UV-resistant. It is also effective in protecting your RV’s roof from the natural elements. It is non-polluting and non-toxic, too. Another positive effect of this product is it provides a bubble-free coating to the roof material. It has an overall consistency, which is quite similar to house paint, which is why it tends to apply easily to the roof membrane’s surface. Many also love this rubber roof coating from Heng as it is capable of contracting and flexing based on the requirements of your RV roof. Such is the main reason behind its ability to withstand any temperature changes. It is also advisable for you to check out the Dicor RPCRPQ. It serves as an EPDM roof cleaner or activator, which also works as the primary part of a 2-part system, which is the combination of the use of an acrylic coating and the cleaner or activator. The cleaner, therefore, aims to prepare your roof. The acrylic coating, on the other hand, focuses on providing a longer-lasting and excellent protective barrier. When the two work together, expect them to produce a lock and key effect. This can then make the coating bond tightly to the old RV roofing. With the ability of this Dicor rubber roof coating to clean and prepare your EPDM RV roof, it is possible for you to take advantage of maximum adhesion once the second part of the coating will take place. You will also instantly realize what a great investment it is once you notice its ability to extend your EPDM rubber roof’s life. Another advantage is its wide coverage. Each quart of this product is actually capable of covering up to 125 square feet. It also tends to dry quickly while being safe to use as it is devoid of any harmful petroleum distillates, citric ingredients, or abrasives that might damage your roof. 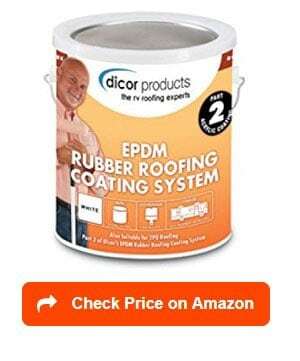 Another EPDM rubber roof coating for RV camper trailer offered by Dicor is the Dicor RPCRC1. Many find this product impressive because of its excellent UV and weather resistance. It is also flexible while providing maximum adhesion. Many of its users also prove how easy its application process is. With the aid of this EPDM rubber roof coating, you get an impressive protective elastomeric barrier designed to prolong the lifespan of the membrane of your RV’s rubber roof. It should be noted that it also works using a 2-part, commercial-grade coating system. Such system operates by combining a cleaner or primer, which is essential for the proper preparation of the roof with an acrylic coating, which then provides a great protective barrier. 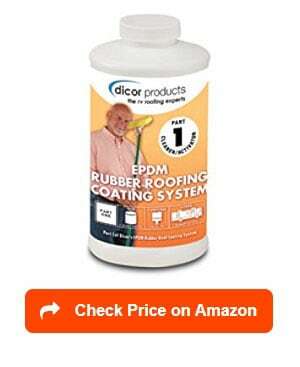 This 1-gallon rubber roof coating from Dicor is also a highly recommended product because of its wide coverage. That said, you can definitely get a return of the money you invest on it right away. It can cover an area of around 125 square feet. It is also a wise choice as it is long-lasting provided you applied it carefully. Furthermore, it offers a high level of protection from the natural elements. It boasts of its durable and long-lasting quality that can last for a minimum of three years. Some also consider the Liquid Roof RV Roof Coating as the best RV roof coating reviews available on the market today. What’s good about this roof coating is that it is offered by Liquid Roof, a reputable provider of products in this industry. You will even find it convenient as it is considered as the only coating system, which is a genuine DIY product. It also does not require you to think too much about weather conditions as it waterproofs right away after application. You do not also need to apply multiple coats. This specific product has a 4-gallon capacity and each gallon is capable of covering around 42 to 46 square feet. In addition, it tends to create a watertight seal immediately. Since it is an EPDM rubber coating, it also makes use of the EPDM chemistry, which is advantages as it means that it won’t be too affected by ozone and ultraviolet rays. It is even capable of tolerating exposure to over 300 degrees Fahrenheit temperature. Such is the main reason why this coating can retain the flexibility of your RV roof for much longer. It is also versatile and flexible that you are given the chance to apply it in the majority of roofing materials, not just EPDM rubber. It has a long-term flexibility while also capable of resisting damages that might be caused by freezing. 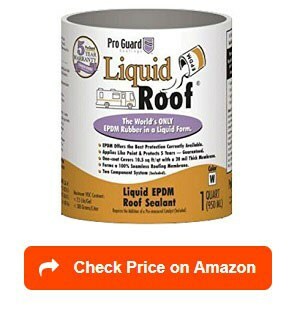 Another product offered by Liquid Roof is this RV Liquid EPDM Coating available at a 5-gallon capacity. 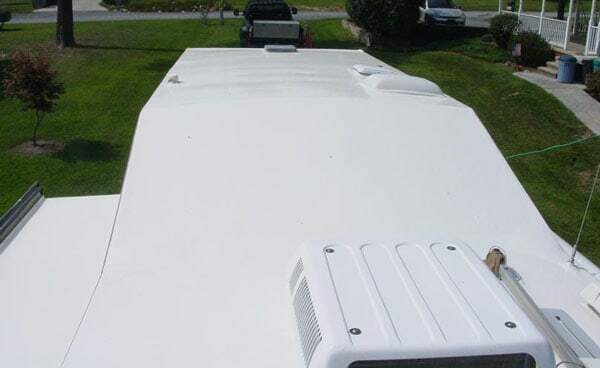 One impressive fact about this roof coating that you have to be aware of is the fact that it is easy to apply it to the majority of materials used in the roofs of recreational vehicles. It is also suitable for use not only on RV roofs but also when doing repairs on mobile homes and trailers. It is also effective in the field of extending the life of your RV roof. With this EPDM coating, you can use a product, which is effective in sealing and repairing leaks found in RV roofs. It can also provide an aesthetic or heat-reflective function into your existing RV roof surfaces. It boasts of its long-term flexibility as well as the fact that it is ozone and UV-resistant. This coating is also impressive in terms of dealing with ponding or standing water. One more reason why it is a popular product today is that many have already proven its ability to waterproof right after application. It is also not prone to damage caused by freezing. The single coat application of this product is known not to shrink nor chalk while also preventing damages triggered by harsh conditions. You might also want to consider using fiberglass coating for your RV roof. While it tends to add weight to the roof while also being more expensive than other options, many still consider it beneficial because of its low maintenance requirement. It is, therefore, an economically sound choice as far as maintenance is concerned. 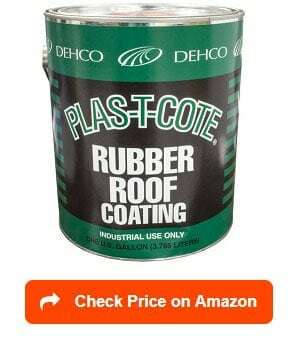 If what you are looking for is a fiberglass roof coating for your recreational vehicle, then the Dicor RPFRC1, which is available in a 1-gallon container is an ideal option. It makes use of a hundred percent acrylic fiberglass resins formula, which is effective in providing a more flexible coating, which tends to contract and expand with each roof movement. It comes in a brilliant white color, making it capable of providing a high level of reflectivity. With this feature, it is also possible for this coating to lower interior temperatures, allowing you to stay in your RV in comfort. Also, with its 100% acrylic resin content, it is possible for it to create a flexible and protective layer. 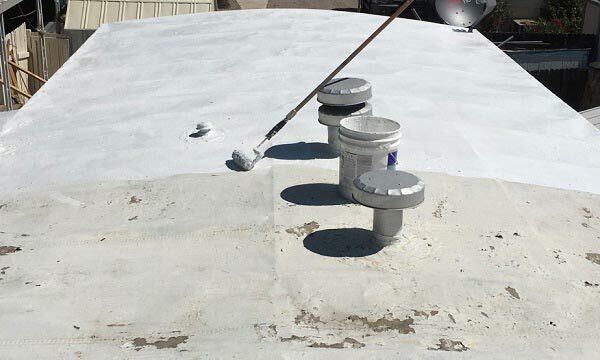 Another reason why many find this fiberglass roof coating impressive is its ability to resist algae and mildew while also being easy to clean up and apply. It has a goal of protecting and beautifying the fiberglass material used in your roof. It also fulfills such goal for RV roofs that were already coated previously. You can also use it in filling up some gaps and cracks in your RV or trailer roof. It can seal cracks and make your RV roof look like new again right after the sealing and application. It is also notable for its ability to seal well. In your search for the ideal coating for your RV roof, you may also want to check out elastomeric roof coatings. This type of roof coating can actually be applied to a wide range of roofs as a means of protecting their underlying material as well as stopping and preventing leaks. The elastomeric coating also limits weathering in the future. Some of these products offer a cooling effect to your RV, thereby promoting a more comfortable temperature inside. This type of coating also tends to stretch and move, which is the reason behind its elastic quality. It is also versatile in the sense that you can use it not only for RV roofs but also for commercial and industrial roofing materials. In addition, the best elastomeric roof coating also serves as an affordable and effective solution designed to repair or fix roof leaks. It is long-lasting with its ability to contract and stretch with ease as a means of adjusting to summer and winter temperatures. It is also beneficial as it can resist mildew and fungi. 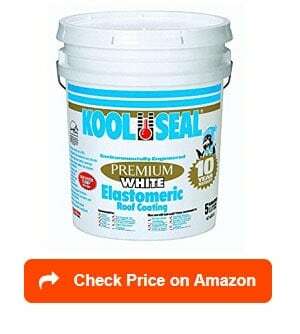 One of the products in the elastomeric roof coating category that you may want to invest in is the 1-gallon KST COATINGS KST063600-16. 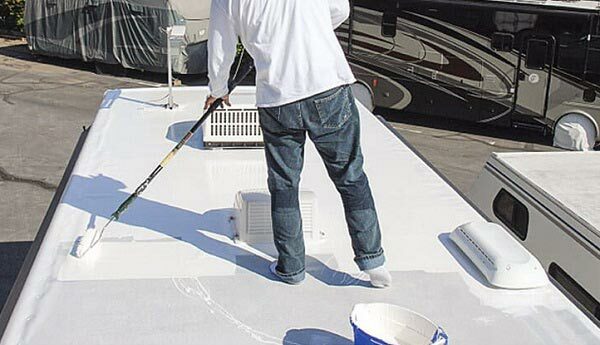 One of the primary functions of this roof coating is to offer protection to your RV roof for years. It is protective as it prevents the roof from being damaged by the elements for years. It is also capable of reflecting more than 90% of the sun’s rays, which further increases its protective nature. In addition, it offers protection from moisture while also being designed to be sturdy regardless of the weather and climate it is exposed in. Such is the main reason why many view it as capable of forming a thick blanket of protection, which is similar to rubber. One more advantage of this elastomeric roof coating is that it is capable of clinging to your roof regardless of the temperature. Once cured, it can resist algae and mildew. It is also known to be safe for the environment. It contracts and expands with your roof while also offering help when it comes to absorbing sounds. Another advantage is that it can fix horrible leaks right after application. The application is also easy but you have to make sure that the area where you plan to apply it is clean. It’s a great product available at a reasonable price, which makes it an ideal option for those looking for reliable roof coatings. You may also find the Dehco 16-46128-4 Roof Coating a valuable and reasonably priced choice in this category. It works effectively when used on RV rubber roofs. It is also effective when dealing with tears and seams on the roof. It can even seal vents as well as air conditioning units. One reason behind the popularity of this roof coating is that it features an excellent exterior durability. It also boasts of its maximum adhesion to rubber. It is convenient to use as it also tends to contract and expand together with the roof. One more thing that is so impressive about this roof coating is that it can resist the UV rays. Once applied, you also have an assurance that it is resistant to cracks while also being efficient in withstanding impact. It is safe for you and the environment, too, as this coating is non-toxic and non-polluting. Each gallon of this roof coating also provides a wide coverage – a max of 200 square feet. Many also find the use of this coating a total pleasure as applying it is easy and flexible. You can put it on the roof with the use of either a brush or a roller. The fact that it comes in bright white is also a big advantage as it provides a cooler temperature in your RV, especially during hot days. Also referred to as Kool seal roof coating, KST Coatings KST063500-20 is an elastomeric coating designed to offer satisfaction to several users. One major highlight of this product is its ability to cling to the roof – that can be expected regardless of the temperature it is dealing with. It is also protective against different types of elements that might cause some damage to it, like moisture, algae, and mildew. The algae and mildew resistant nature of this product can be expected to perform its job once the coating is finally completely cured. Another positive reason for using this elastomeric roof coating is its reflective nature against UV rays. In fact, it is known for reflecting over 90% of the UV rays. It is known for being one of those products that comply with environmental instructions that well. It has a sound-absorption feature, too, while being known to contract and expand together with your roof. The cleanup process is also a breeze as it is possible to do it with water only. The application is easy as you can do it using an extended roller and brush. For the edges, using a small roller would suffice. Once applied, you will instantly notice its ability to make your RV roof look brand new again. If you are in search of a high-quality, liquid roof coating, then this product will not disappoint. The quality of this coating is top-notch as it is known for being up to 400% elastomeric. 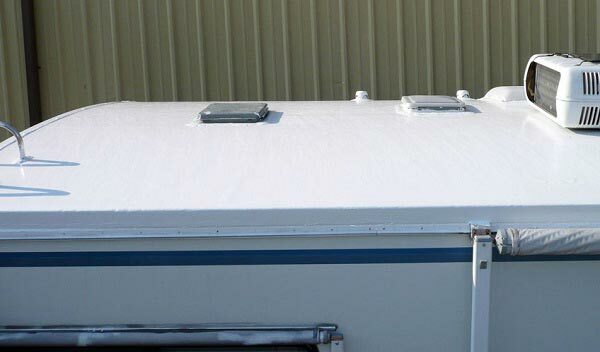 It also comes in the form of white liquid that when applied can also provide a white coating to your roof, providing a much cooler environment inside your RV or mobile home. With the help of this product, you can waterproof the roof of your RV and mobile home. It is also possible for you to maintain its excellent condition. With its ability to reflect up to 85 percent of the sun’s UV rays, you also have an assurance that your mobile home or RV’s interiors will stay cool even when it’s the summer season. Another reason why this coating is such a popular product today is that it is capable of curing as a means of producing a longer-lasting, tougher, and more elastic and seamless membrane than those products based on latex acrylic and petroleum. It also results in renewing the look and sealing your roof. What’s more? It is known to supply a high level of protection against the elements. It extends the lifespan of your roof, too. It is flexible and sturdy when facing a wide variety of temperature while also having the ability to resist peels and cracks. There is also no need for you to worry about the possible damage that might be caused by snow, ice, rain, and wind with this coating. 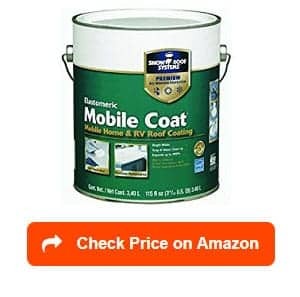 You can also start checking out different reliable RV roof sealer reviews if you want to check out what’s the best RV roof seam sealant that you can use. The best sealant for RV roofs is actually capable of preventing leaks in your roof, thereby keeping you safe and fully protected from the cruel weather. It should be noted that your RV roof will be exposed to rain, freezing, and thawing that will eventually cause cracks. By using a high-quality sealant, it is possible for you to seal all cracks in the roof permanently. The result is cool camping within your RVs. The use of the sealant will also prevent you from facing expensive repairs in the future. 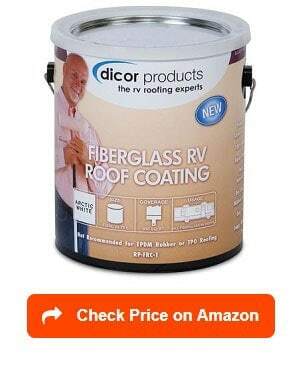 One of the primary reasons for investing in this popular Dicor RV roof sealant is its top-notch quality. It is high in quality in the sense that it is effective in creating a seal along the edges of your roof. It can also seal the areas surrounding the air vents, screw heads, and vent pipes. One of the plenty of good things about this product is its guaranteed compatibility with different kinds of roofing material. In addition, it provides an impressive adhesion to different types of materials, including aluminum, concrete, galvanized metal, wood, mortar, and vinyl. 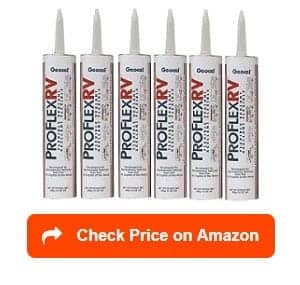 Available in white, this is one of those products for RV roof caulking and sealing guaranteed to stay flexible while also sealing cracks and other parts of your RV roof that need to be sealed. The fact that it is UV-stabilized is also a big advantage as it means that it can prevent discoloration and deterioration. It produces a professional look, too. It is not like other sealants that tend to leave peaks and ridges after use. With that benefit, it’s no longer surprising to see users perceiving it as the best RV roof caulking solution. You will also find this sealant tape from EternaBond impressive. One of the positive things about this sealant is that you can easily install it. Putting it on your RV roof is easy in the sense that it only requires preparing the surface prior to use. It also boasts of its high elongation factor. With this feature, you have a guarantee that it allows the roof seal to contract or expand along with the changing conditions. It would be best to use it during hot or sunny weather. 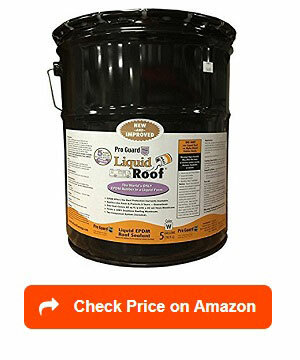 It is an excellent solution to all surfaces in your roof that require sealing. This sealant tape works in a way that it won’t separate from your RV. It is because of its guaranteed sticky nature. You can also easily cut it based on the size of the surface you have to seal. Just make sure that you take extra care when aligning it as once it attaches, you will have a difficult time repositioning it. This sticky effect just shows how effective it is in terms of sealing cracks and other issues. With ToughGrade Self-leveling Lap Sealant, you can finally take advantage of a solution for cracks and other parts of your RV or motorhome that require sealing. It is effective in sealing different parts of an RV including its roof edges, and the areas around the vent covers, screw heads, air conditioners, and vent pipes. It also has a lower risk of causing discoloration and deterioration as it is stabilized to protect the sealed area from UV rays. Note that this self-leveling lap sealant is ideal for application in horizontal areas and surfaces. One of the many things that people say about this product is that it is easy to use. It is also known for keeping water out, thereby protecting the interiors and sealed parts from the damages that might be caused by moisture. It can seal seams found on RV roofs, too. You will not also face problems cleaning it up after application. The last but not the least recommended product is the Geocel 28100V Pro Flex RV Flexible Sealant. The flexibility of this sealant is one of the reasons behind its popularity at present. It is flexible in the sense that it works appropriately for different models and makes of vehicle. It is known for sticking well to the surface where you plan to seal. 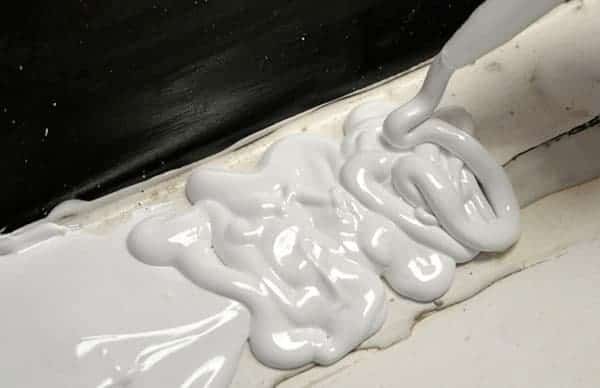 While it’s not a water-based sealant, note that it tends to stick really well while also having a thick enough texture that won’t run after application. 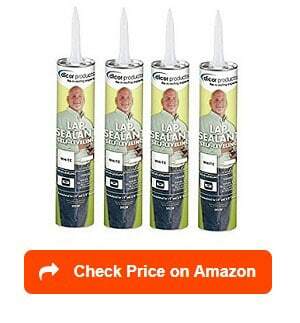 You will also realize how hassle-free it is to use this sealant once you notice how it appropriately works with other caulking and sealing tools. One more thing noted in this product is its ability to hold up in different weather conditions, particularly winter. It is effortless to work with. Furthermore, it tends to remain pliable for a bit after each application. With that benefit, you have more time to press and shape it. An RV roof coating is one of the things you have to invest in if you want your RV to serve its purpose for quite a long time. It serves as an ideal maintenance partner as it can help maintain the functionality of your vehicle’s roof. It also prevents the roof from incurring damage caused by the UV rays of the sun, as well as snow, rain, and wind. Durability – Check the durability of the RV roof coating before buying one. The durability of this product is fully dependent on how often you will need to replace the coating. If you are planning to buy either liquid sealants or tapes then take note that their durability is based on two important qualities – elasticity and tear resistance. You will know that it is durable if it is elastic, meaning it is capable of twisting and turning without diminishing its important sealant properties. You also have a guaranteed of the product’s durability with its tear-resistant nature. This means that it is capable of standing the raw force and huge impact before tearing or breaking. UV resistance – You also need a UV-resistant roof coating. Note that UV radiation is an electromagnetic radiation taken from the sun. In case this hits specific materials, it triggers a chemical reaction. When your RV roof is exposed to it frequently, there is a possibility that it will experience wear and tear. You should, therefore, choose a roof coating, which is UV-resistant. That way, you will gain a hundred percent guarantee that it is capable of offering full protection to your roof as far as UV radiation exposure is concerned. With UV resistance, the coating also helps in maintaining the right amount of heat in the roof, resulting in a cooler environment within your recreational vehicle. This feature also serves as a roof protection guaranteed to protect that part of your RV from the harsh weather. Water Repellency – It is also advisable to pick an RV roof coating, which is waterproof. With this feature, rainwater can be prevented from penetrating your recreational vehicle. One way to figure out the water repellency of a roof coating is to read and understand its compounds. Such can help you ascertain whether the coating can help you. What is good about having a water-repellent or waterproof RV cover is that it ensures users that outdoor moisture will never affect it, thereby offering protection to the roof. You have to look into this feature as the roof cover will most likely be exposed to the changing weather. What is an RV Roof Coating/Sealant? An RV roof coating or sealant is a product that plays a major role in your RV roof’s maintenance. Applying it regularly is crucial in providing the roof in your RV a new shine. Remember that a new roof coating is needed at some points in your RV roof’s life. This especially holds true for rubber roof, which might become chalky. It might also wear off gradually with time. With the help of a highly reliable RV roof coating or sealant, you can revive the good condition and look of your RV roof. Another thing that this coating or sealant can do is to prevent water and other forms of moisture from penetrating your vehicle. With that, it can help properly secure all the things and features found in your roof. You can even use it around skylights, roof vents, and any other parts that need to be secured. How Does an RV Roof Coating/Sealant Work? An RV roof coating or sealant works in extending the life of your RV roof. It does so by lessening the transfer of heat into the roof. It also works in reducing thermal shock caused by the thermal contraction and expansion of the RV roof’s membrane. Furthermore, it can help mitigate leaks. You can also expect most roof coatings, especially the reflective ones, to lessen energy costs while also improving your roof’s aesthetics. Take note that how the roof coating will work will depend on what material is used in producing the topmost part of your RV roof. For instance, if it is plastic then a rubber coating might be the ideal solution for it. If the roof is constructed out of a metallic material then both liquid and rubber roof coatings can work for it. How the roof coating will function is also dependent on the specific type you have chosen. Learn more about the different types of roof coating or sealants in the next section of this article, so you will no longer have a difficult time formulating a well-informed decision. Rubber Coating – This is one of the most commonly used roof coatings by RV users and owners. It actually comes in two classifications. The first one is that constructed from thermal poly Olefin while the other is from ethylene propylene monomer. It is important to note that maintaining the two requires different procedures. With that in mind, it is advisable to consult the user’s manual all the time so you will know exactly how to maintain it. Acrylic Coating – If you are on a budget but still want to invest in a decent coating then the acrylic type is ideal for you. It delivers a decent performance as it provides good reflectivity and leak protection. It can also resist the UV rays. This type requires you to apply two coats – the primer and the fabric reinforce. However, there are also some drawbacks to it, such as its inability to handle ponding water, which might cause the degradation or peeling of the coating, as well as leaks, in the long run. Silicone Coating – This coating is a bit expensive and sold on a per-gallon basis. Despite its high cost, though, you will instantly realize that it is worth it because of its numerous benefits. One advantage is that it only needs a single coat. There is no need for a primer, which may reduce the cost when basing it per project. It also boasts of its high reflectivity, wind degradation, and resistance to weather. It can also resist ponding water. Furthermore, it has the ability to stay extremely elastic for a long time. Expect it to not become brittle nor hard too fast. Liquid Coating – This type boasts of its being naturally water repellent, which makes it effective in preventing corrosion. What is good about the liquid RV roof coating is that it is easy to apply. The only thing that you need to do is to apply it in a similar method used in painting. It is not only water repellent. You can also expect it to offer protection from ultraviolet rays, thereby helping in prolonging the life of your RV. It also adds to the aesthetic appeal of your RV’s roof. Fiberglass Coating – One thing that makes a fiberglass roof coating a viable option is that it is economically sound as far as maintenance is concerned. It requires less maintenance compared to the other types of RV roof coatings. The problem is that it is a bit costly and tends to add more weight to your roof. In addition, it is not that easy to install. Urethane Coating – What is good about this RV coating is that it offers several benefits when used off the road. It is more durable than acrylic and silicon. It can also provide a good resistance to impact, making it perfect for use in areas with high traffic. Furthermore, it is UV resistant, reflective, and capable of resisting ponding water. One problem, though, is its high price. Installing it might also expose you to some strong and unwanted odor, which might cause an issue if you install it in an area with many people. 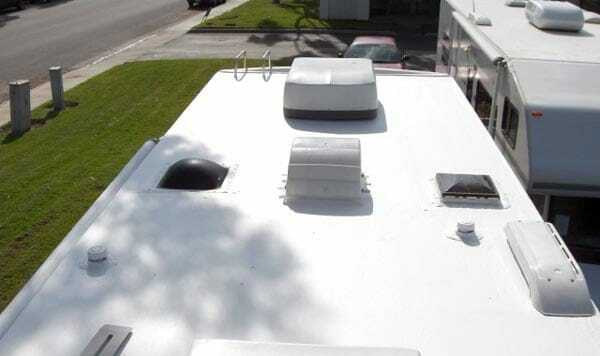 Extends the life of your RV roof – By using a good RV roof coating, it is possible for you to prolong the life of your RV’s roof. Note that energy loss, drafts, and leaks are all ingredients for a miserable trip. By applying the roof coating, you can protect your roof from the mentioned elements and issues, thereby prolonging its life. It can also protect your roof from all the things that can degrade its performance, including snow, rain, wind, twigs, dirt, leaves, UV rays, and sleet. With its ability to extend the life of your roof, you will surely have a wonderful time using your RV for a longer period. Prevents leaks – Another positive thing that an RV roof coating can do is prevent leaks. Keep in mind that leaks have the tendency of ruining your RVs interiors. It can trigger discomfort and damage to the installation. Leaks can also reduce your RV’s value. With the help of a roof coating, you can prevent leaks from appearing. If there are already leaks, then you can also apply the coating to stop them. The ability of roof coatings to prevent leaks is a great advantage as this results in a lower risk of costly repairs. Your RVs interiors can also remain safe. Promotes a more comfortable environment in your RV – This benefit especially holds true if you decide to use a reflecting coating, like silicone. Such a coating is guaranteed to provide users with more comfortable interiors. You can expect this to happen with the help of the coating’s reflectivity that can keep your vehicle cool. This is a good thing, especially during the summer. It also prevents your RV from heating up excessively during the winter season. The ability to maintain a comfortable atmosphere in your RV is indeed one of its most amazing benefits. You can appreciate this benefit as it also promotes a hassle-free and comfortable experience on the road. Protects your roof – Another benefit of RV roof coating is that it offers protection to your investment, which is your RV, right from the start. 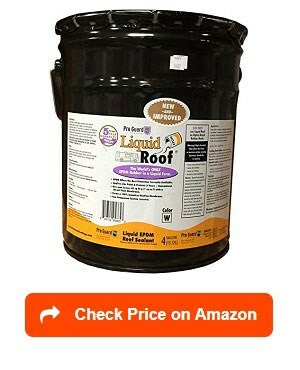 It protects your roof. In case something happens to the applied roof coating, you can immediately remedy that by applying a new layer of it, instead of taking your vehicle into a dealership. What are good RV roof coating brands? Several brands of roof coatings for RVs emerge in the market today, making it convenient for RV owners to make a selection. The wide range of options for this product makes it a glory to buy since you can really find one that suits your specific needs. One brand that might evoke your interest is Proguard. It offers a liquid roof coating, which is ideal for use on a newly installed RV roof made of rubber. One thing that makes it stand out is its ability to work with just one application or coating. You might also want to try Dicor. It has a roof cleaner or activator, which gives your RV roof the kind of coating that it deserves. It can even prepare your roof prior to the actual coating, increasing its chance of meeting your requirements as far as RV roof coating is concerned. Other trustworthy brands of RV roof coatings are KST Coatings, EternaBond, ToughGrade, and Dehco. Does Flex Seal work on RV roofs? The answer to this question is a big yes. Take note that Flex Seal is one of the most versatile roof coating or sealant available in the market today. 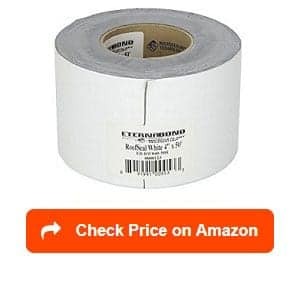 With that, you have a hundred percent guarantee that it will work well on your RV roof. It is perfect when applied to gutters, campers, RVs, mobile home roofs, gutters, vent pipes, and skylights. When used in an RV roof, you are assured of its ability to seek into holes and cracks. Once dried, you will also notice that it is a flexible, watertight, and rubberized coating designed to last for quite a long time. It seals out water while also staying pliable and flexible. How Flex Seal works, however, will also depend on the type of material used in your RV roof. It works well on fiberglass and metals but not that great when used in EPDM rubber roofs. How to apply an RV rubber roof coating? A rubber coating is one of your best options if you are looking for a coating for your roof. Applying it is not also difficult. You just need to apply the best rubber roofing product to enjoy its durability, flexibility, reliable protection, and UV stability for a long time. The first step in applying the coating is to measure the width and length of your RV roof. Determine the roof’s actual surface area by multiplying the two measurements then dividing the result by 42. The result will give you a rough estimate of the number of gallons you will need for the whole RV rubber roof coating application process. Make sure to apply the coating in an area with proper ventilation. Get rid of any source of ignition. Note that uncured product is considered as a flammable liquid. Also, ensure that the product needs to be in an area with room temperature to make it much easier to apply. Prepare the roof’s surface afterward. You can do that by combining water and laundry detergent then using it to give your roof a power wash or scrub it. Your goal is to get rid of as many surface dirt as possible. Take out anything, which is made of silicone. It is because you can’t expect the coating to adhere to this material. You should also remove poorly adhering roof coatings and loose caulking. Flush these things out using clean water. Let the area dry completely. Once it dries, you should get a brush and use it in applying a light coat of the rubber coating. Your goal here is to cover depressions, seams, and any other options that protrude to the roof. These include pipes, skylights, and vents. Also, apply a light coating on areas that are quite difficult to access using a roller. In case of rounded edges in a roof membrane, ensure that you put on a light coating with the help of a brush. Apply this to the rounded edges as well as the vertical part. Let the coating dry for around three hours. After that, you should put on more coat (but make sure that it is just thin) to the whole roof surface with the help of a nap roller. Once done, you should let it dry for approximately 48 hours. After 48 hours, get a long nap roller and use it to apply a finishing coat, if needed. 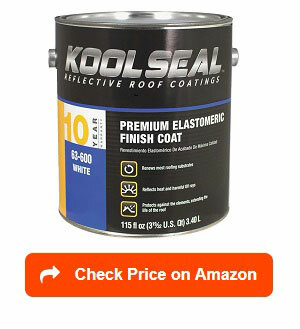 How to seal a camper/trailer/RV roof? Sealing the roof of your camper, trailer, or RV is actually an activity that you can do on your own. The first step, in this case, is to clean the roof thoroughly. Your goal here is to get rid of all the dirt particles. Dry the roof completely. After that, your next step is scraping old rood or debris. Be extra cautious when you are performing this step as it might punch a hole or elongate a tear in your RV roof. Check with your dealer so you can determine the specific sealant that is compatible with your RV roof. You should then wear gloves. Use a trowel or paint brunch to apply the coating into your RV roof evenly. Seal anything that sticks through your RV’s roof, including vents and antennas. Note that such areas have the tendency of developing small leaks, causing a gradual damage to your RV. Coat the seams well. Make sure that you cover all seams, instead of just the damaged parts. With that, you can have an assurance that leaks will be prevented. In case your roof is either torn or ripped down, it is advisable to buy the fiberglass repair tape. You should then spread your chosen RV sealer over the part that requires a patch. Put one piece of the tape over the problematic patch. You should then cover it by applying more sealer. No one can downplay the importance of using the best RV roof coating. That’s why you really have to figure out which one is the most appropriate product based on your RV roof material. Check which one can make it look brand new while also protecting it from harsh elements, too, before finally making your choice. We would like to thank you for reading this article. 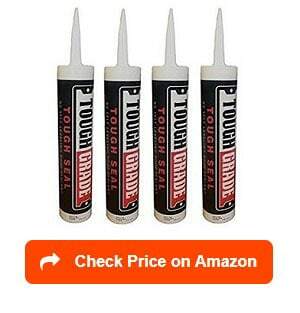 Find out more about how to choose the best RV wax and best RV caulks with our reviews and ratings. Furthermore, please take a look at the best RV wash and wax, best RV roof cleaners and best RV awning cleaners to choose the right one for your RV cleaning, storage and maintenance. An RV roof repair & replacement head quarter is right here and you stopped by for learning everything you need to know about repairing and replacing your RV roof. Roof leaks repair solves all your issues. What happen if after using dicor self leveling it rain about 2 hours after the sealing of roof. what must I do now will I have to clean it all up and start over. Do these sealants dry sticky to the touch? I once used a sealant on my TT and it dried sticky and attracted dirt. Thanks! Where can I get that much plastic to cover my RV. I have a 35′ fifth wheel. You can use rubber rv roof coating, it also works for plastic surface. What about using Liquid Flex Seal on RV roofs? It works too. not a bad idea.